This ensemble is very popular with collectors and is hard to find. It was only made for one year. 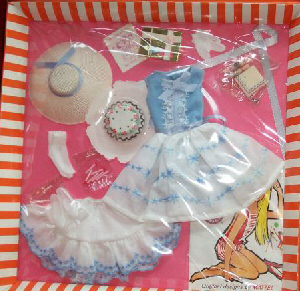 The accessories are especially hard to find and even the dress is harder to find (and therefore more expensive) than most Skipper clothing from this era. When found, the hat is usually frayed around the edges. Leave Vintage Skipper Happy Birthday, Go to Vintage Skipper.